The Muscadine antioxidant grape, it's small, it's unassuming and it's a secret grown right in America's own back yard and now used for Antioxidant Grape Juice. "America's First Grape," the muscadine, was already growing wild in America before European settlers arrived back in the 1500's, and they started cultivating it soon after that. Since then, generations and generations of Americans have grown them, but only in the last few years has the true power and potential of this treasure really been discovered. The fascinating history and secret power of the Muscadine grape is a story everyone should know. Unlike any other grape in the world Muscadines grapes (vitis rotundifolia) grow in the harshest of conditions; conditions in which common table grapes (vitis vinifera) cannot grow. They grow in the southeastern United States and are well-adapted to warm, humid climates. So, what protective strategies does this survivor grape contain that allows it to thrive where others can’t? Muscadine fruits are 1 – 1.5 inches in diameter and are armed with thick, tough skin and several hard, oblong seeds. Their thicker skin allows it to protect itself against heat, UV radiation, humidity, insects and fungi. Muscadines also contain 20 sets of chromosomes compared to 19 in other grape varieties. So scientists wonder, what is this grape doing with the extra genetic material? Perhaps this is the key to its remarkable potency against inflammation, tumor growth and diabetes. Muscadines are a Native American grape and may be the only fruit that originated in the United States and nowhere else. 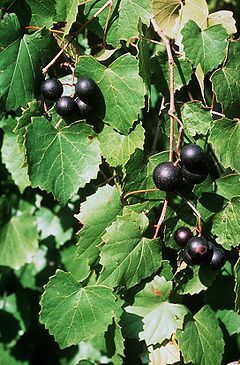 Native Americans clearly used the wild muscadines as a food source and processed them for winter stores. Could it be that a powerful defender of our health can be found in our own backyard? * Muscadine has one of the highest ORAC scores of any fruit produced by Mother Nature. *The Antioxidant Grape Juice provides a superior content of specific antioxidant compounds, which means both a higher level and better blend of antioxidants to fight the free radicals that enter the human body. * One of nature's best sources of resveratrol, and studies on resveratrol have linked it to a healthy heart and blood vessels. Foods with a high ORAC like antioxidant grape juice, score may be able to protect cells and their components from oxidative damage. Oxygen radicals are chemicals that form naturally inside the body through the process of oxidation. Everyday functions such as digestion and physical activity produce oxygen radicals. Daily exposure to polluted air, rancid food and oxidizing radiation from the sun and electrical appliances also contribute. An easy to understand example of oxidation is to imagine rust attacking metal. When the rust eats away at the metal, the metal starts to weaken and decay until it can no longer work. This is what happens to our body when free radicals attack it. Organs, cells and other parts of the body can be weakened by oxidation. This leads to diseases such as cancer, skin and heart diseases, senile dementia and osteoarthritis. As it turns out, muscadine grapes are an outstanding source of multiple protective antioxidants. There is a growing interest among academic scientists and researchers in the study of the nutra-ceutical benefits of muscadine antioxidant grape juice because of their unique range of vitamins, beneficial oils, fiber, nutritious sugars, proteins and potent phenolic compounds (antioxidant phyto-chemicals). Our country’s current epidemic levels of chronic disease have reached alarming rates. Presently, 109 million Americans (more than a third of the population) suffer from a chronic disease, such as diabetes, cancer, heart disease, and autoimmune disorders like rheumatoid arthritis and fibromyalgia. *Helps avoid early development of chronic diseases. *Effects adaptive changes in gene expression that help defend the body against ill effects of aging. * Phyto-chemicals improve DNA repair by activating a pathway that increases lifespan in human cells. Muscadines have evolved over hundreds of years to withstand the harsh conditions of their environment. Clearly, their unique nutritional properties separate it from other grapes and researchers believe that they have only scratched the surface of the potential of muscadine grapes. Our Select Antioxidant Grape Juice is a high-end juice product with a proprietary blend of red grape juices featuring muscadine grape juice as the primary ingredient. The blend also includes syrah grape juice and Cabernet grape juice, both of which provide high levels of antioxidants, and a natural grape pomace powder for added antioxidant benefits. • Helps you reach the recommended 3000 to 5000 daily ORAC units, with 3764 ORAC units per serving. • Fights free radicals with a high proprietary blend of unique antioxidants from grapes. • Helps protect against the negative health effects of pollution and other toxins. • Promotes healthy circulation, immunity, and younger looking skin. 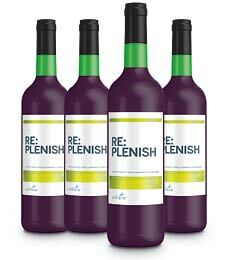 I need RE-Plenish if . . .
• I don’t consume at least 5 servings of high ORAC foods daily. • I want extra support for healthy circulation, immunity and younger looking skin. • I want to support nerve and brain function. • My doctor or dentist has recommended an antioxidant supplement. • I want to fight the aging effects of a toxic environment and poor diet. Allergens: Contains no major allergens. Contains no milk, egg, wheat, soy, corn, peanuts, nuts, fish or shellfish. If you are taking medications, consult with your physician or pharmacist before making changes to your diet, exercise or supplementation program.